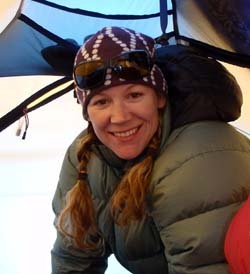 Currently our Climber Support Coordinator at Mountain Trip, Lisa began guiding in Alaska in 1994, following a couple of seasons working in Antarctica. She is another school teacher by trade and has taught Alaskan youths out on the Aleutian islands in the town of Dutch Harbor. She grew homesick, however, and now teaches in Telluride, Colorado where she skis the backcountry with Todd and their Chessy, Lola. If she answers your phone call, listen for the voice of their rapidly growing boys Logan and Dalton in the background.